Club Med playground for the rich or isolated Communist backwater? Can Cuba find a third path? There are a number of no-go zones in the world for Barack Obama these days. Damascus is enemy territory. Most of Iraq and Afghanistan are too dangerous. Pyongyang has never hosted a sitting U.S. president, and Kim Jong-Eun frankly prefers Americans with better jump shots. We now have a nuclear deal with Iran, but there are no trips of reconciliation to Tehran on the White House calendar. Relations with Moscow are frosty, and don't expect a trip any time soon to Ankara either. Oh, and it would probably be a bad idea for the president to show up at a Trump rally as well. But this week, President Obama is in Havana, and the greeting crowds have been enraptured. Such a trip was inconceivable back in 2008, when Obama was running for president. But as he enters his last year in office, the president is determined to make his détente with Cuba irreversible. He does after all face quite a few people who oppose his effort to end the half-century of enmity between the two countries. For instance, even though the United States and Cuba formally reestablished diplomatic relations last July, Congress is dead-set against lifting the economic embargo against the island that has been in place since 1960 and that, according to an International Trade Commission study in 2001, costs the U.S. economy $1.2 billion a year (not to mention what it costs Cuba). Politicians like Rep. Ileana Ros-Lehtinen (R-FL), who was born in Cuba, have dug in their heals. Not surprisingly, she was not enthusiastic about Obama's trip to Havana. "A visit by President Obama more than one year after his unilateral concessions to the regime will only legitimize the Castros' repressive behavior," she wrote in a letter in February. Outside of Congress, a vocal group of anti-engagement Cubans continue to press for regime change on the island and partner with right-wing dissidents inside Cuba itself. These are the "Platistas," named after "an amendment to the Cuban constitution authored by US senator Orville Platt giving the United States the legal right to intervene in the country's internal affairs," as Sam Farber describes it in a valuable piece at Jacobin. The Platistas have lots of gringo allies, and it's not just crusty old Republicans. Plenty of Cold War liberals, like The Washington Post's Richard Cohen, have similarly Jurassic viewpoints. The key issue here is "the right of the Cuban people to decide their own future." Ideally, that means that the United States will respect Cuban sovereignty and stop trying to change its system. But there's regime change via military intervention like the failed Bay of Pigs operation of 1961. And then there's regime change through the pocket book. 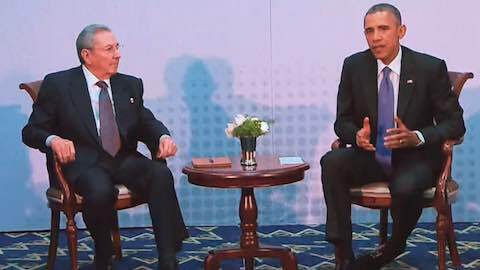 "U.S. business leaders are not interested in seeing Cuba fail," Obama told Cubans at a forum. "We are interested in seeing Cuba succeed." But success on whose terms? There's big money behind engagement with Cuba. The agricultural lobby has been pushing for years to remove the remaining restrictions on U.S. companies securing a larger share of an estimate $2 billion market in food imports. In 2008, U.S. agricultural exports to Cuba peaked at $710 million, falling to a mere $180 million last year. U.S. farmers have lost ground to the European Union, Argentina, and Brazil. Manufacturers and the tourism industry are also eager to break into the Cuban market. They are strong forces behind the organization Engage Cuba, an effort to persuade Congress to change its mind about trade with the island. As with so many other issues, Congress is way behind the times. On the eve of Obama's visit, for instance, Starwood Hotels and Resorts made a deal to convert three hotels in Cuba into luxury accommodations. Carnival announced that it would begin cruises between Miami and Havana on May 1. Over the last year, 13,000 American tourists stayed with 4,000 Cuban hosts through Airbnb. And Google, having set up a model high-tech communications center on the island, is planning to vastly improve Internet access for Cubans. While the right continues to believe that isolation will force out the Castros, the left is worried that capitalism will transform the system by other means. Cuba is like a vast undervalued neighborhood outside of Miami that's ripe for gentrification, and capitalism abhors such a vacuum. Some in the Cuban government fear that the proffered carrot has been poisoned; others are hoping to get a nibble for themselves. Cuba stands at a historic crossroads. Down one path lies strict adherence to the revolutionary legacy of the Castros. Down another path lies a revival of Cuba as a playground of rich moguls and shadowy criminal types, as it was just before the revolution. Are there any other paths that Cuba can take? The economic reforms that Raul Castro has ushered in since he took over in 2008 resemble the early days of change under Mikhail Gorbachev in the Soviet Union in the late 1980s. Private restaurants and room rentals have cropped up all over the island, just as they had throughout the Soviet Union when I visited in 1990. An estimated 500,000 entrepreneurs currently represent 10 percent of Cuba's workforce. Foreign capital has also established a foothold, usually in the form of joint ventures. Like perestroika under Gorbachev, the Cuban reforms are slow and methodical. This is no shock therapy a la Poland 1990. It's even slower than what took place in China or Vietnam. "The Cuban government has opted for a sequence in which an experiment is done first, the results are checked and adjusted, and the tested project is then generalized by the creation and adoption of the legal framework," writes Pavel Vidal Alejandro in the Journal of Economic Policy Reform. "The test sequence and generalization makes the Cuban reform process rational, but slow." The results, compared to Vietnam, have also been modest. Alejandro points out that growth rates for the Cuban economy after seven years of reforms were around 2.8 percent. Vietnam experienced growth at twice that rate during the initial years of its doi moi reforms. Cuba is going slow because it doesn't want economic and political reforms to precipitate a Soviet-style regime collapse. And, like China, Cuba is worried about the fate of its many state enterprises. Exposed to market competition, they could very well fail, and the state certainly doesn't want hundreds of thousands of angry workers on its hands. For this reason, Cuba has done some reforms in the financial sector (microcredit, banking) and the consumer sector (house sales), but it hasn't introduced any privatization. Another key element that stabilizes Cuban economic reform is the role of the military. "Facing tough competition and following years of decline, Cuba shut down the Ministry of Sugar in 2011 and replaced it with Azcuba, a state-owned company run by the military," writes Stratfor. "Azcuba partnered with Brazilian company Odebrecht in 2012 to manage the 5th of September sugar mill in Cienfuegos." The military is even involved in tourism through its Gaviota enterprise, which will be working with the Starwood chain. Some might take the military's involvement to be a sinister sign. However, it ensures the support of the generals by giving them a stake in reform. The other lesson of the Soviet reforms that Raul Castro has learned is the same one absorbed by the Chinese leadership: whatever the speed of the economic changes, political reform will proceed at a glacial pace. The Cuban Communist Party has done very little to shake up the system aside from the usual anti-corruption campaigns. A few dissidents have been released from prison (and some have even been rearrested). There's a bit more openness in the cultural sphere. But this is no Havana Spring. Perhaps the most important change has been in the freedom to travel. Since 2013, Cubans can leave the country with relative ease, as long as they have a passport, an identity card, and the funds to buy a ticket out of town. As with the Mariel boatlift in 1980, which emptied the prisons and sent waves of "undesirables" to the United States, the new travel rules serve as a safety valve. For those who remain unhappy with the situation inside Cuba, they have a clear alternative to protesting on the street: they can protest with their feet. The New York Times recently reported, "More than twice as many Cubans went to live in the United States last year than in 1959, when Mr. Castro's brother Fidel came to power and unleashed a wave of migration that altered South Florida forever." For the more than 11 million Cubans who remain on the island -- and all those who are lured back to live in the country of their birth -- a set of critical decisions await. Most Cubans want change, but they also want to retain some aspects of the current system. The free health care system is quite cost-effective. Free public education is taken for granted, though private instruction is spreading. One obvious change in Cuba is the emergence of a new class system. Those who work in the new private sector or have access to remittances from abroad can afford the new restaurants and services. The rest have to get by on about $28 a month (an improvement over the last couple years but not by a lot). The class divide is also a racial divide: Cubans with darker skin are less likely to benefit from the new order. According to Cuban economists, whites are more than twice as likely as blacks to receive remittances. The Cuban government at this point could conceivably make an abrupt, North Korean-style U-turn in its economic policy. But it's not likely. Nor is the leadership going to invite in a group of free-market economists from the University of Chicago to orchestrate an overnight transition to go-go capitalism. So, what are the options for a mixed economy in Cuba to preserve some features of the old as it gradually innovates? One major option involves cooperatives, which have long existed in the country's agricultural sector (where 70 percent of the workforce is private). The Cuban government has been experimenting with turning state enterprises into cooperatives that are run by the workers themselves. "One such company is the Bella ll Health and Beauty Institute, a beauty salon in Havana," reports Jonathan Wolfe. "It used to belong to the Cuban government, but was recently converted into a cooperative. Tania Lourdez Ortiz Fernández gives facials there. She made about $14 a month when Bella was run by the government. Now she makes about $42. Plus she has a say in running the business." Other cooperatives include the Taxi Rutero bus service, the Karabali nightclub in Havana, and various produce markets. There's even a television program on Sunday nights called "Culture of Cooperatives." "An emphasis on cooperatives would help to maintain ownership and diffused control and profit-sharing among local citizens, thereby promoting greater equity in income distribution," writes economist Archibald Ritter. "Generally speaking, cooperatives have passed the 'survival test' but have not made huge inroads against private enterprise in other countries over the years. Perhaps this is because the 'transactions costs' of participatory management may be significant. Personal animosities, ideological or political differences, participatory failures and/or managerial mistakes may occur. And for larger coops, complex governance structures may impair flexibility." Still, it's the early days of these cooperatives, and they offer a promising alternative to both state and foreign ownership. Not all outsiders are eyeing Cuba for the huge profits that can be made. In the tourism sector, for instance, the Center for Responsible Travel is running eco-tours to Cuba that combine education, conversations with Cubans, and environmentally sustainable journeys outside the capital (my predecessor at Foreign Policy In Focus, Martha Honey, is running these tours, and there are still some spots available on their May trip). Cuba has a unique opportunity to translate its revolutionary ideals into a 21st-century idiom. Small-scale private enterprise, an expanded cooperative sector, mutually beneficial joint ventures with sympathetic foreign investors, a strong social welfare state, greater respect for human rights and dissent: this would be a viable path between Cuba as the next Club Med and some reversion back to an isolated, autarkic state. Such a post-Castro Cuba could attract back many Cuban émigrés and reestablish the country as a model for countries around the world that are disenchanted with neoliberalism. After eight years, the Obama administration's mantra generates little more than mockery in the United States. But perhaps, by using the power of his office and Congress be damned, Obama has managed to help bring some "hope and change" to Cuba. Latin America: "Cuba: Hope and Change?"